Barclay Moore has two passions in life: woodworking and skiing. An East Coast transplant, born and raised in central New York, Moore began tinkering with wood tools at ten, earned a degree in engineering from Cornell in 1976 and spent the next two winters as a ski coach in Hunter, New York, while working odd jobs during the summer. 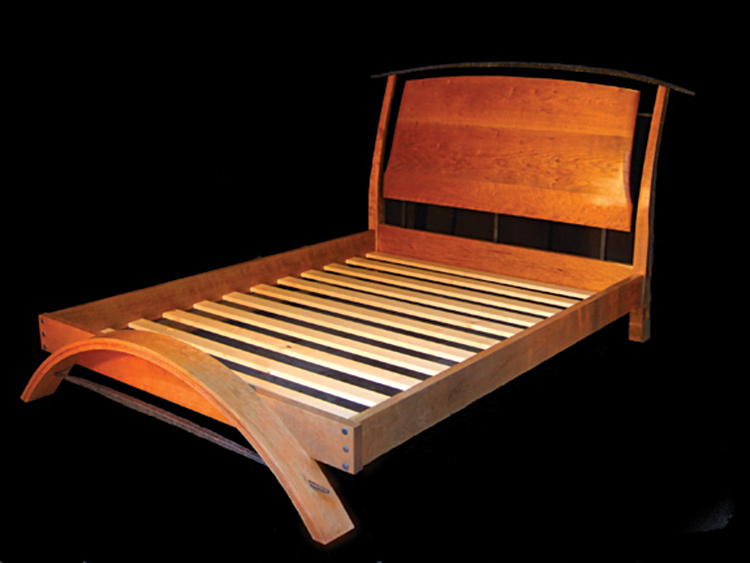 Then he heard of a woodworker (“a very talented gentleman,” says Moore) looking for an apprentice. Moore spent the next two years “learning, building and trying.” However, the apprenticeship didn’t pay, so he left after running out of money and returned to the ski industry fulltime. In 1986, he moved to Homewood to start his woodworking career, thinking even if the business went bust, at least he’d enjoy good snow in the meantime. He found a cheap apartment with rental space underneath to use as a woodshop. Twenty-seven years later, he’s still in the same apartment, his woodcarving tools and forges in the same under-apartment spot. While Moore’s shop turns out relatively few pieces—somewhere between 10 and 12 annually—he produces incredibly in-depth and creative work. “Some take two months, some take two weeks,” he says. A piece began in that way a few years ago. “I got a phone call, this woman named Susan called me and asked if I could come over,” says Moore. Though leaning on crutches and recovering from surgery, he found the address and hobbled up to the door, his portfolio under his arm. He knocked on the door, which opened into a small foyer and a second entry door. He could see the shape of a person open one door, then, noticing the crutches, step behind the main door so Moore would have room to get in. Moore adds other mediums to his custom pieces to his well. While working on pieces for the Beck home in Martis Camp (see Home Awards, page 98) he took the family’s love of motorcycles and added Harley part details to the bar stools. Black walnut end tables were adorned with lumber saw blades. 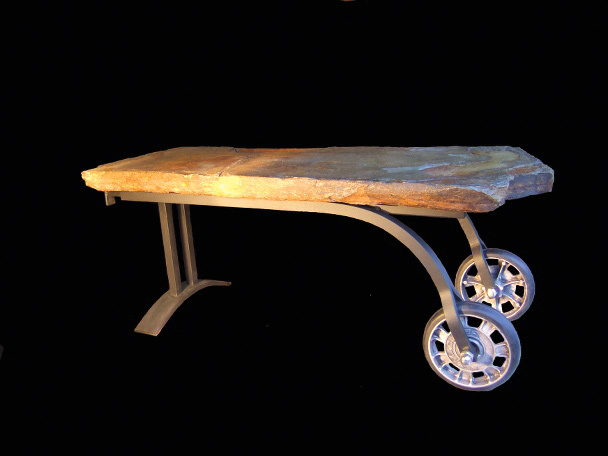 He’s created a coat and pant valet that uses Lake Tahoe rocks for its feet. 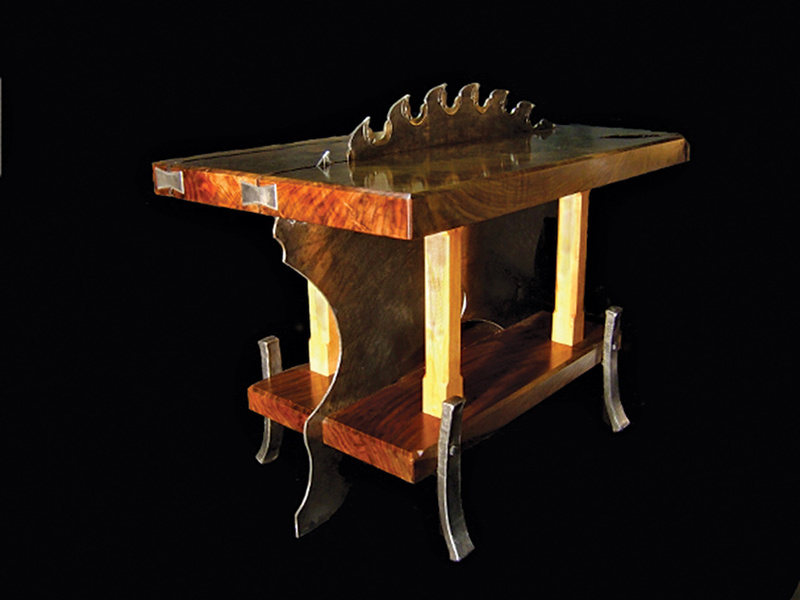 He inlays many of his works with stone, copper or hand-forged details. His light fixtures—from hanging pool table lights to floor lamps—utilize a mixture of glass and metals. “I try to learn something on each project,” he says. Moore employs millennia-old techniques to create custom works: mortise and tenon joints, dovetails, pegged and wedged joints. These methods, which date back to the time of Stonehenge, take considerable time and effort, but result in strong, functional and timeless pieces. The care and time Moore puts into his work have earned him an impressive reputation. In the nearly three decades since going out on his own, the artisan has never gone without work. “There is always a backlog,” he says of the waitlist, currently about six to eight months. Now, Moore exclusively takes on commission work. “It’s not as much fun as spec work where I can do anything with no outside influence, but art is hard to sell,” he says. His favorite words? When a client says, ‘Do what you want.’ “Then I go a bit wild,” he says. “But talking with the family, seeing their house, their likes, gives me a springboard to the design process. To learn more about Barclay Moore, visit www.barclaymoore.com or call (530) 525-7608. Reno resident Alison Bender learned that, even if you write a nice article about him, you still can’t get bumped to the top of Barclay Moore’s wait list.